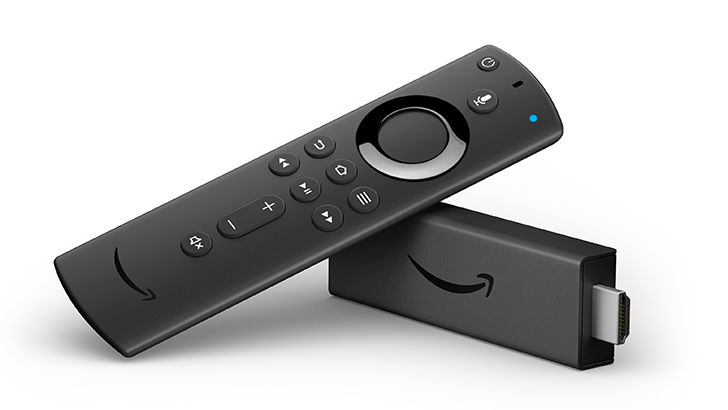 Amazon already sells two 4K streaming devices — the Fire TV 4K ($69.99) and Fire TV Cube 4K ($119.99) — but today the Seattle-based tech company has revealed a gadget that brings 4K to a more affordable form factor: the Fire TV Stick 4K. The device, available to preorder for $49.99, comes with a redesigned Alexa Voice Remote featuring volume buttons and supports HDR standards HDR10, HDR10+, and Dolby Vision, as well as Dolby Atmos for audio. The Fire TV Stick's support for HDR10+, a relatively new standard, distinguishes it from competitors like the Chromecast Ultra, Apple TV 4K, and Roku Premiere. Additionally, it's the first of Amazon's Fire TV Sticks to feature Dolby Vision. If you're more interested in the new Alexa Voice Remote it comes with, though, it's available alone for $29.99, or with the Fire TV Cube for $119.99. The remote uses Bluetooth and multidirectional infrared technology, allowing it to communicate with a variety of compatible TV and AV equipment in addition to providing voice command functionality. Plus, for the first time, it features volume, mute, and power buttons. The Fire Stick TV 4K starts shipping on October 31st in the United States and Canada, and will ship in the United Kingdom, Germany, and India on November 14th. Japan is also getting the device this year, though the company provides no specific date. The same shipping timeline goes for the single Alexa Voice Remote.